« Picture of the Day! The Rebbe! Baruch Shehecheyanu Vekimanu Vehigianu Liz’man Hazeh! 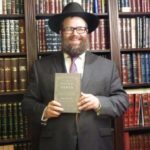 In what may be the most important development in chassidic publishing since the translation of the Tanya in the 1960s (and just in time for Yud-Tes Kislev), Purity Press has announced that the Alter Rebbe’s classics, Torah Or and Likkutei Torah—considered the “Oral Torah of Chassidus” (Tanya being the “Written Torah”)—have been adapted into readily accessible English for the first time since the maamarim they contain were originally delivered over 200 years ago. The first volume in the six-volume series, containing 12 fundamental maamarim (discourses)—one for each weekly Torah portion in the book of Bereishis—has just been released, with Hashem’s help. This is to be followed, G-d willing, throughout the year with volumes on Vayikra, Bamidbar, Devarim, Shmos, and the Jewish holidays. In honor of Yud-Tes Kislev, the “Rosh HaShanah of Chassidus,” the publisher has prepared a maamar in English about the supremacy of good over evil. It can be downloaded free in convenient booklet format by clicking here, or visiting www.PurityPress.org. The style of this groundbreaking work, titled Words of the Living G-d: Selected Discourses from Rabbi Schneur Zalman of Liadi’s Classic Torah Or (or Likkutei Torah, depending on the volume), is absolutely unique, and has received acclaim from people all over the world when reviewed prior to publication. Rather than translating the discourses word for word, necessitating extensive footnotes and technical material—and resulting in a work still inaccessible to many—they have been conveyed in straightforward English as though one were reviewing them at a Shabbos table for guests without extensive background in Chassidus. Explanations and background material have been seamlessly woven into the appropriate places within the text, making the profound and inspiring content unusually easy for even beginners to understand. At the same time, of course, the material itself remains true to the original discourses, and provides a faithful rendition even for those with more background who are studying them in English. “In Torah Or and Likkutei Torah one can find some of the most fundamental principles and concepts in Jewish mysticism—indeed, some of the most profound secrets of the Torah—laid out for the first time in Jewish history in a manner readily comprehensible to anyone. Prior to their elucidation by the Alter Rebbe, these lofty ideas were accessible only to a relative handful of saintly rabbis, whose refined souls and lifelong efforts at spiritual purification had elevated them to the heavenly plane on which such concepts resided. Rabbi Schneur Zalman’s essential achievement was to draw these G-dly ideas ‘down to earth,’ to bring them down to the level at which even the average person could read and understand them, and thus attain a greater knowledge, love and fear of G-d.
“The Kabbalah teaches, ‘In the sixth century of the sixth millennium, the portals of wisdom above, and the fountains of wisdom below will be opened, and the world will be prepared for the spiritual elevation of the seventh millennium [i.e., the Messianic Era]. . . . This is alluded to in the words, “In the six hundredth year of the life of Noah . . . all the fountains of the great depths burst forth.”’ Torah Or was published in 1837, followed by Likkutei Torah in 1848. As the Rebbe points out, this time period corresponded with the end of ‘the sixth century of the sixth millennium’ (i.e., the Jewish years 5500-5600, or 1740-1840). These two works were great breakthroughs in the process of articulating Chassidus in rational and intellectual terms. In fact, the … Tzemach Tzedek … remarked that the predictions of the coming of the Mashiach in the year 5608 (1848) alluded to the publication of Likkutei Torah. Words of the Living G-d: Selected Discourses from Rabbi Schneur Zalman of Liadi’s Classic Torah Or (Volume I: The Book of Genesis) is available now through your favorite Jewish bookstore. 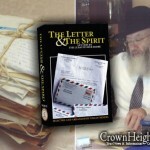 To view a sample chapter, or if your bookstore does not yet have Words of the Living G-d, Vol. I, readers can visit the publisher’s website, www.PurityPress.org. For more information or for bulk orders—or to inquire about available dedication opportunities—please email info@PurityPress.org. eimosai kaasi mar? k’chsheyafutzu mayonosecha chutzah! There was no mention of the name of the editor or translator/compiler of this work in either this article or the link at http://www.PurityPress.com Why leave out that information? Yitzchok D. Wagshul translated these. He’s a Lubi lawyer and has them on the web at http://www.likuteitorah.com/, and it looks like he created Dach Holdings, Ltd. (or sold the publication rights to them) for publishing them.